Freddie Quell (Joaquin Phoenix) a WWII veteran turned drifting vagrant, wakes up on the ocean-liner of Lancaster Dodd (Philip Seymour Hoffman), a writer and self-proclaimed doctor/nuclear physicist/philosopher. The two men, enchanted by each other, form a bond that poses a threat to Dodd’s spiritual organisation “the cause” which has accepted the troubled Freddie as its newest member. Yes, Dodd (called “Master” by his publisher) is an incarnation that bears an irrefutable resemblance to Scientology founder and leader L. Ron Hubbard however the film never pertains to any biographical agenda. Freddie, on the other hand, is a being whose inclined shoulders, apish mannerisms, rutted jaw and furrowed gaze resembles no one. He is unlike anyone – a man with a vague history whose experience of war is denied to the viewer, with a haunted aversion to confinement (was he a prisoner of war?) and taste for torpedo fuel. 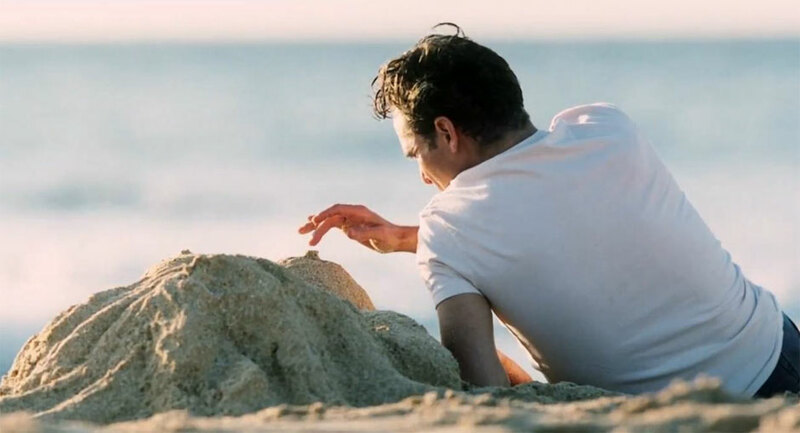 While we learn several factors that may contribute to Freddie’s current condition of trauma, it seems that it is love that he consciously accepts as his life’s tragedy, and we are offered a defiled, disproportionate maiden, made of sand, as its corroding symbol. The relationship that Dodd and Quell form has an indefinite quality. Dodd believes himself to have met Freddie before, and first looks upon him, charmed by this strong, familiar connection. We cannot be sure if Freddie shares this belief, or if Freddie believes in anything – and submission to Dodd requires him to consider that he is an eternal spiritual being – and this is something that perhaps we must attempt to consider also as Freddie does not fit any medical or scientific estimation of man. Their first “processing” interview procedure reveals as much about Dodd as of Freddie’s past. Dodd lingers on the word “envy” – and we know he feels envy, treading New York’s upper-class, in attempt to captivate, and infiltrate them but envy is something that doesn’t effect Freddie – he makes no attempts at the women of “the cause”, submits himself to willingly to humiliating trials of spirit, but does not appear to accept any of his mentor’s teachings – though he doesn’t deny them – uninterested in eternity, uninfected by his mortality. We now know there are scenes missing from this enigmatic film, and certain long tracking shots that we observed in teasers and trailers are omitted. What we do receive is a film of such grandiosity and human feeling – two performances that are so astounding in their most intimate, minute physical refinements – and a disarming, disambiguating propulsion from Jonny Greenwood’s exquisite score. 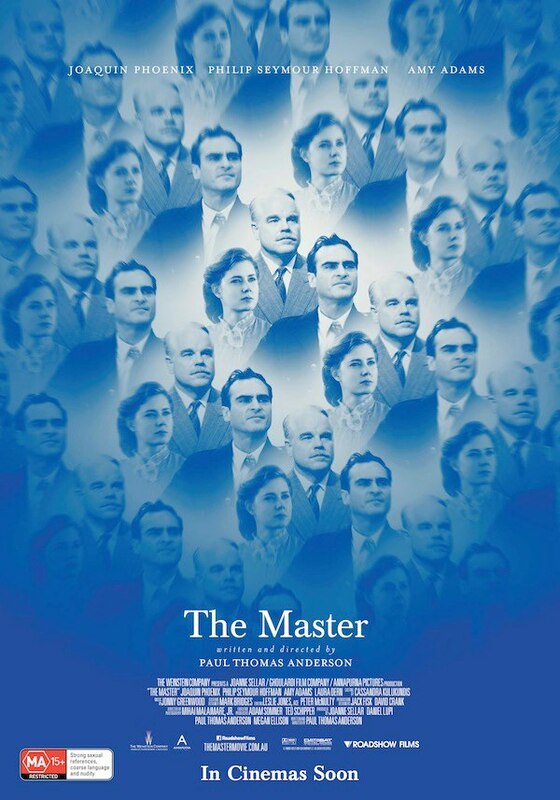 The kaleidoscopic poster for Paul Thomas Anderson‘s The Master is a family portrait of Dodd, Quell and Dodd’s wife (Amy Adams) cast in a blue and white hue in which the position of the two men is in a pattern of constant exchange. Our experience of Quell and Dodd is a timeless, endlessly changing, completely disputable knowledge. The photograph becomes unreliable, a manipulated historical document, memory’s projection is disallowed, and perception – of man, of love, of family, of eternity – is defiled, and washed out to sea. Throw yourself into it, over and over again.